Melissa Petersen is the editor of Edible Memphis magazine, http://www.ediblecommunities.com/memphis/, a quarterly devoted to building connections between farmers, food artisans, and the community. Melissa spoke to the Memphis Herb Society about the food we eat, what it takes to bring it to the table, and what it means to us. She described how our food is so much more than nourishment for our bodies. We use food to celebrate special family events. Certain foods bring back special memories. Many of those who buy our honey at farmers markets relate to us that their grandfathers kept honey bees. Others seek comb honey because they have nostalgic memories of eating honeycomb as a child after family members robbed a bee tree. The Herb Society members know that cooking often involves preparing foods using home-grown herbs for special occasions. Melissa reminded the audience that bringing food to the table requires hard work from numerous individuals. Preparing food in a commercial kitchen involves long, busy, hot, hours, by a team of dedicated workers. 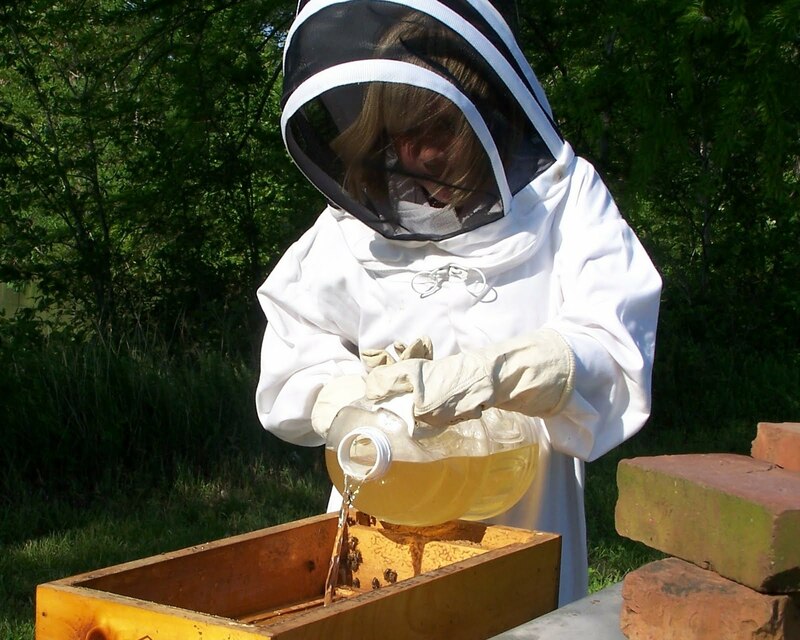 Beekeepers recognize the commitment involved in harvesting honey in the summer. Honey supers are heavy; protective bee suits are hot; and some guard bees always find exposed skin. Mary Phillips, who worked with us at Peace Bee Farm, is featured in the Memphis Commercial Appeal: http://www.commercialappeal.com/news/2011/jun/24/farm-fresh/. Mary is helping bring fresh food to inner-city areas known as “food deserts.” In parts of some cities it is said to be easier to buy a handgun than a fresh apple. Mary is helping correct this by managing a midtown farmers market, helping community gardens, and building raised-bed backyard vegetable gardens. She is also teaching farming at a girls’ school. 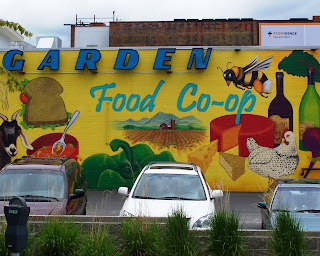 Mary says that food “transcends all barriers—class, gender, race, and age.” In our recent travels, we encountered a food coop in Spokane, Washington, featured in today’s photo. See http://www.mainmarket.coop/. Without pollination from the honey bee, the only pictured food available to us is the bread and the macaroni noodles in the soup. The bear has often been associated with bee hives and honey in works of fiction. However, the diet of bear has not always been clearly understood. 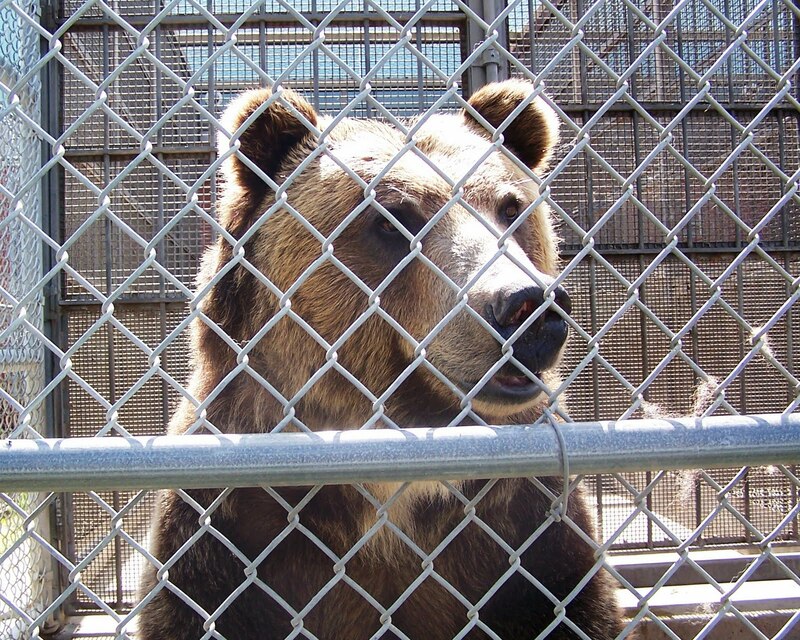 Research into bear diet as well as other areas of bear health, physiology, and behavior is conducted at the world’s only facility designed to house North America’s grizzly bear, the Bear Research, Conservation, and Education Program located on the campus of Washington State University at Pullman, Washington. 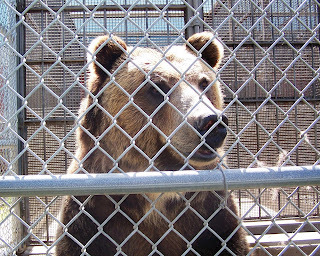 Researchers study bears in their natural habitat as well as captive bears like this young grizzly in the caged facility. Grizzly bears, the great omnivores of the Northwest, reach a weight approaching one thousand pounds. Researchers at Pullman determined that when pine nuts are available bears consume large quantities of these seeds of conifer trees. These massive animals require large amounts of high-protein food to build up body reserves to carry them through long winters in the Rocky Mountains. At times the bears gain four hundred pounds before starting hibernation. While grizzly bears are known to eat large mammals such as moose, elk, deer, bison, and black bears, their diet is largely comprised of grasses, moths, and berries. Grizzlies will eat insects, including bees, if they are available, but some of the locations where grizzly bears are found are at high elevations and lack sufficient flowering plants to support honey bees. Grizzly bears catch large numbers of salmon in the mountain streams when the ocean-dwelling fish return to their birthplace to spawn. Researchers at Pullman found that bears enrich the terrain surrounding the streams where they catch salmon by spreading nitrogen-rich waste which nourishes the pine trees. The seeds of berries are spread in the waste of bears. Bees provide the pollination that makes the fruit and seed production possible, and the bear waste fertilizes the plants growing from seed. Honey bees and grizzly bears play important roles in supporting wildlife in the American Northwest. Washington State University is also active in conducting honey bee research. The queen excluder is an important part of the modern honey bee hive used to separate the brood nest area from the stored honey. The device is simply a sheet of metal or plastic with openings sized to allow worker bees to pass through but block the larger drones and queen bees. A queen excluder is typically placed above the hive bodies that hold the brood nest. As many surplus honey supers are then placed above the brood nest as are needed to store the colony’s honey. The use of queen excluders offers several advantages to the beekeeper. First, with no brood being reared in the frames devoted to honey production, the honey is clean and free of eggs and larvae. The absence of brood in the honey supers means that there is little protein being deposited in the supers. The protein comes from pollen used to feed the larvae and from silk cocoons spun by pupae. It is protein that attracts hive scavengers like wax moths. Frames of beeswax honeycomb from honey production can usually be stored over winter without chemical treatments. They merely need ventilation. Frames that held brood are often damaged by wax moth larvae while in storage. Some beekeepers prefer to not use queen excluders; they even call them “honey excluders.” They feel that the bees produce more honey without a queen excluder in the hive. However, bees can easily be encouraged to move through the queen excluder to store honey in the supers by “priming” the super with a frame containing honey or even with frames of drawn comb. Today, I found an "upside-down" hive, a rather rare occurrence. The brood was above the queen excluder; the honey below. When the colony superseded itself, the new queen made its mating flights. When she returned to the hive, the queen, still quite small, was able to pass through the mesh of the queen excluder. I moved the queen and the brood down below the queen excluder. Honey bees derive food from wildflowers by gathering nectar and pollen. Honey bee colonies require very large populations to gather enough nectar to make a surplus of honey. The worker honey bees’ foraging behavior makes them seek nectar sources that provide the largest amount of nectar with the greatest concentration of sugars. Foragers fly past weak nectar sources to get to stronger sources farther away from the hive. Throughout the spring the honey bee colony strives to gather nectar, make honey, and build its population to allow it to divide and create a new colony in a new location. By dividing the colony and swarming, the bees are able to increase their numbers, expand their range, and move away from old chemical and disease spore-laden honeycombs. Pollen is also necessary for honey bees. When a number of different flower species are in bloom, a variety of pollens are brought back to the hive. The pollen contains proteins, fats, vitamins, and minerals. The proteins are made of amino acids, but some pollens lack certain amino acids required for complete nutrition. If diverse flowering plants are in bloom, the bees are able to feed the developing brood a complete diet. 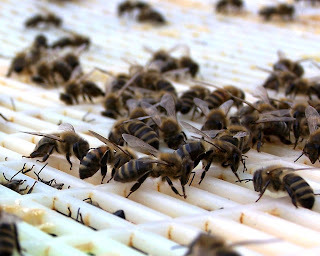 For the colony to provide adequate nutrition for the brood, it is important for the colony to have a population of young workers with well-developed glands to produce worker, drone, and queen food. We harvested Tennessee spring wildflower honey today. It is light in color and flavor and has the aroma of flowers. Peace Bee Farm participates in the Teddy Bear Picnic, an annual children’s event held at the Memphis Botanic Garden. We explain the role of honey bees to children and parents; many are already familiar with honey bees. 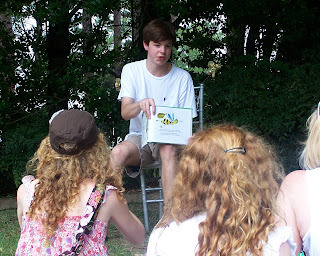 Seventeen-year-old author Joel Cox reads from The Peanut Butter Bee, a children’s book that he wrote and illustrated. The Christian Brothers High School student studied honey bee biology, and then wrote an inspirational book about the determination of a worker honey bee. The past four years, marked by heavy colony losses, have been costly to beekeepers. News stories have made this a time of expanding awareness among much of the public of the dwindling number of honey bees and the importance of honey bees and other pollinators in producing our food. Hopefully, the next five years will bring about a greater understanding of the conditions affecting honey bee health. Beekeepers will continue to study honey bee biology and try to learn more about the pests and pathogens that attack bees. Concerted efforts will be made to improve plant diversity on farms and public lands. Farmers will modify their tillage and planting practices to provide food and habitat for bees and native pollinators. Beekeepers will fight to resist the importation of bees from foreign countries to lessen the possibility of spreading pests and diseases. Queen bees may be carefully imported to expand genetic diversity. Hopefully, we will learn how to solve beekeeping and environmental problems with lesser use of chemicals. Colony Collapse Disorder will become another controllable condition of the bee yard. Already, we are seeing an increase in the number of people putting a couple of bee hives in the back yard. They bring ideas and enthusiasm. They attend beekeeping association meetings and learn how bees are affected by humans and how we alter the environment. The hives of these new beekeepers also serve the existing bee colonies by supplying diverse drones to mate with queens. Most new beekeepers in North America build traditional Langstroth bee hives, but many explore other styles. Two writers offer views of bee hives developed in other countries and in earlier days: Buck White’s Bee Hive Journal, http://beehivejournal.blogspot.com/, offers design drawings for numerous bee hives and equipment. Amy Leigh shows bee hives from around the world at http://benefitsofhoneyblog.com/beekeeping-innovations/. She describes Langstroth, National, and Egyptian hives as well as skeps, bee gums, and hollow log hives. Erin Underhill, age seven, feeds a queen mating nucleus hive. Four years of study of the great die-off of North America’s honey bees revealed the scope of the losses. No single cause of the honey bee colony losses emerged, however combinations of pathogens appear to be involved when bee hives lose their adult populations. Surveys of beekeepers revealed that over-winter colony losses averaged 30 percent; however, individual beekeepers’ losses varied widely. One fourth of the beekeepers surveyed experienced winter-time losses above 55 percent, and another fourth of the beekeepers had winter losses of 15 percent or less. Replacing lost colonies is expensive, and thirty percent annual losses are not considered sustainable. If the beekeeping industry cannot be maintained, a large segment of our food production is at risk. The risk increased in the past decades with the arrival of parasitic mites when the feral honey bee colonies which contributed to food crop pollination largely disappeared. What has been learned from the surveys of beekeepers is that losses vary among beekeepers and from one location to the next. A new five-year study of beekeeping operations is intended to identify the factors that allow some beekeepers to keep bees with low colony losses. The investigation, funded by the USDA’s National Institute of Food and Agriculture, will look at beekeeping management practices and environmental conditions in the bee yard and forage areas. Penn State’s enthusiastic Dennis vanEnglesdorp will lead the project. Those who would like to participate in the project can sign up at http://beeinformed.org/. The study will employ tools used by epidemiologists studying diseases of humans. As results of the study are gathered, beekeepers will be able to design their own beekeeping program following what works and what doesn’t. Beekeepers will continue to select from their strongest colonies, and, hopefully, over time surviving bees will become resistant to certain pests and pathogens. As an example, honey bee resistance to tracheal mites seems to be spreading in recent years. 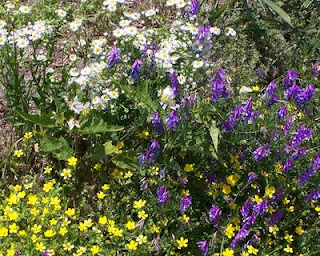 In today’s photo spring wildflowers abound: bull nettle, buttercups, spring asters, and common vetch. Most beekeepers that I have met are continuously trying to learn about honey bee biology and the craft of beekeeping. They belong to beekeeping associations, attend meetings, exchange ideas with other beekeepers, read books, and carefully study their own bees. Before parasitic mites entered the United States in the mid-1980s, beekeepers were able to learn the craft from others, purchase some bees, and expect them to live. After the arrival of parasitic mites and the viruses they vector, small hive beetles, resistant strains of existing honey bee diseases, and a new strain of Nosema disease, keeping bees alive got increasingly difficult. Adding to the stresses upon the honey bees were the increased use of insecticides and pesticides by both beekeepers and others, the importation of honey bees and pathogens from foreign lands, increased migratory movement of bee hives, and nutritional stresses from altered weather patterns associated with a changing climate. 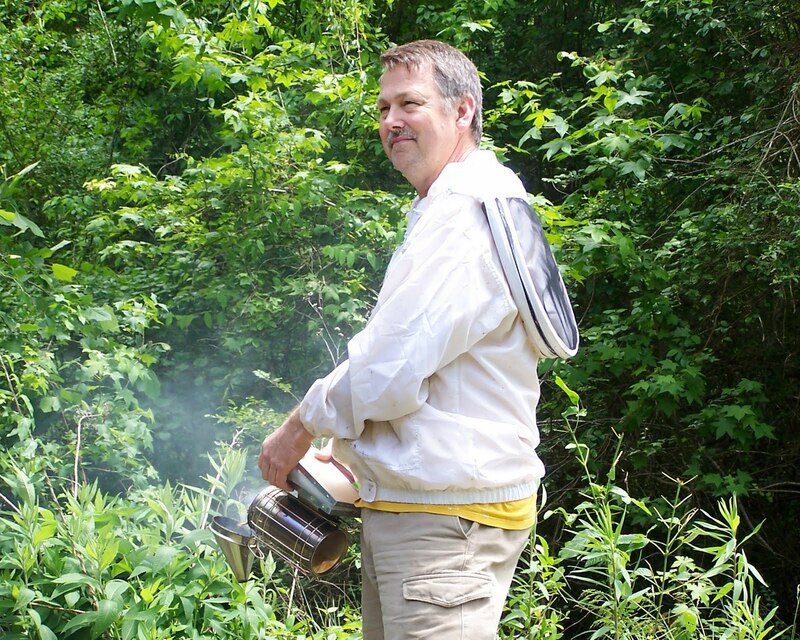 Responding to requests for training in greater depth, the University of Arkansas Cooperative Extension Service offered an advanced beekeeping workshop. Beekeepers from across the state converged on the Arkansas 4-H Center near Little Rock for three days of presentations, hands-on participation, microscope laboratory work, and bee hive inspection. David Burns of Fairmont, Illinois, pictured lighting a smoker before beginning a session on building a queen cell starter hive, conducted a class on raising queen bees. David covered queen rearing from selecting breeder stock to preparing starter and finisher hives and queen mating nucleus hives. Grafting was practiced, and some non-grafting techniques were discussed. David, who writes informative beekeeping lessons at http://basicbeekeeping.blogspot.com/, produces queens and packaged honey bees. He handles bees with a gentle touch. As we built a queen cell starter hive, David used a turkey feather to flick young bees off brood frames. Three quick flicks of the feather removed the bees with less disturbance than with brushing. David explained that he always wears a yellow shirt when working his bees so that they will remember him. Beekeeping is a small but important part of a changing agriculture. Every year sees changes being made in agricultural production techniques resulting from efforts by farmers to produce food and fiber to an ever increasing world population. Along with greater demands for agricultural products there is an increasing pressure on the producers to adjust to increases in fuel and other costs. One of the easiest ways to reduce fuel costs is for farmers to find ways to reduce tillage of the soil. Such approaches, which may be called “conservation agriculture,” can have benefits for the farmer and the environment. 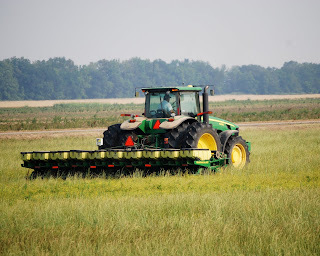 Conservation agriculture is based on farming techniques that keep a cover crop on the ground at all times, disturb the soil at a minimum, and provide for crop rotations. For more, see http://www.fao.org/ag/ca/. Any changes in agriculture affect beekeeping operations in the area. The lessened plowing of fields should immediately benefit many native bees that nest in the soil. These bees lose habitat through industrial agricultural practices that destroy their nest along field margins. Today’s photo shows soybeans being planted into unbroken soil covered in annual grasses. In the distance, a winter wheat field is harvested in the morning and planted the same afternoon without tilling the soil. The grasses and competing crop weeds are killed by an application of herbicides. This planting technique reduces fuel usage, saves ground water, and helps conserve organic matter in the soil, increasing tilth. No-till planting lessens soil erosion, and sometimes reduces fertilizer use. Since weeds spring from broken ground, no-till planting reduces the germination of weed seeds. A New York Times piece, http://green.blogs.nytimes.com/2011/06/04/damaging-the-earth-to-feed-its-people/, describes how no-till planting may lessens the release of nitrous oxide, a greenhouse gas. Agriculture accounts for the release of a considerable amount of the greenhouse gases that are affecting the world’s climate. All forms of agriculture, including beekeeping, are looking for management practices that are more sustainable and less damaging to the environment. All stand to benefit from careful planting. Honey bees have the same basic needs as people: a safe place to live and raise offspring, an area to collect food and water, and an environment free of toxins. This was the message that I presented to a receptive group of business leaders in Ripley, Tennessee. Beekeepers understand that bees need a dry hive to protect the bees from the weather. The hive should be elevated to prevent it from flooding and to allow for air to flow around the hive. The hive must have provisions for ventilation. The hive’s honeycombs should be free of chemicals and disease spores. Places for honey bees and other pollinators to find food are becoming increasingly less common, especially in areas of industrial agriculture. The soil is often tilled to the edge of the field leaving no unplowed field margins. The result is the loss of bee forage and nesting area. 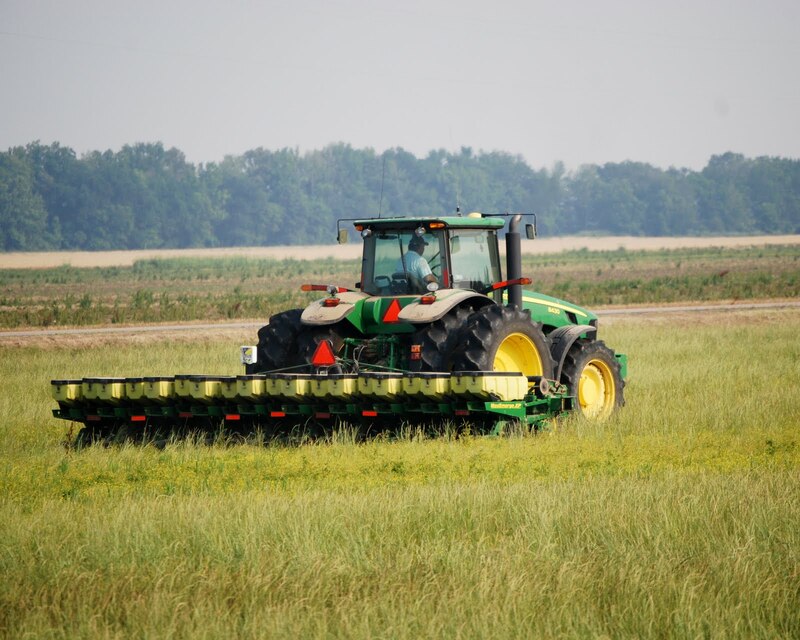 Monocultural plantings of a single crop often reduce the available forage. Monoculture may lead to lower food quality due to a lack of a diversity of nutrients. Insecticides, pesticides, and herbicides in the environment as well as miticides used by beekeepers kill bees outright or build-up in the beeswax honeycomb of the bee hive. Broad-spectrum insecticides kill every insect present, including pollinators and other beneficial insects. Persistent insecticides remain in the soil for a long time and kill and weaken bees well into the future. Mixing together more than one chemical agent or increasing the strength of insecticide sprays are especially damaging to bees. I encouraged the business leaders to use their influence to help control the use of pesticides in agricultural settings, around homes and gardens, and on golf courses. Many attending were surprised that our entire luncheon was dependent upon insect pollinators with the single exception of the dinner roll. 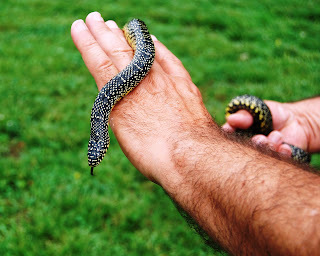 Today’s photo is a speckled kingsnake, a harmless resident of a Peace Bee Farm bee yard. Snakes are welcomed protectors of bee hives and help control rodents during warm weather.